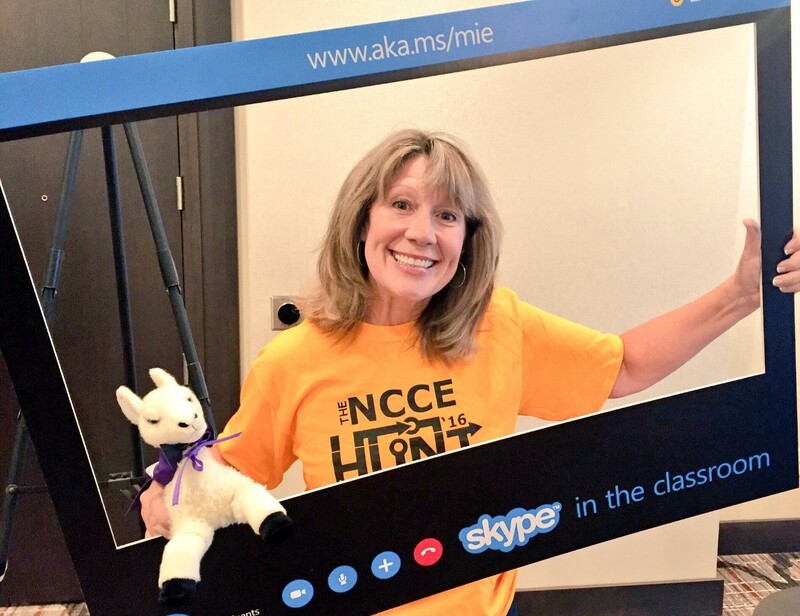 With 16 years of experience under her belt, Adams is not only an MIEE, she’s also a Surface Expert, Skype Master Teacher, Microsoft Certified Educator and Master Trainer. She regularly researches emerging technologies, trains staff on tools and classroom integration, trains students, and evaluates hardware. In fact, in all, Adams has spent over 20 years championing new technologies in schools. But seeing herself as a leader has taken some getting used to. Adams’ real passion, though, is professional development – especially as it relates to energizing teachers with relevant tools for 21st century learning. So much so, that with her guidance, over 17 schools and 1000 teachers in her district have completed Microsoft Innovative Educator training – an impressive undertaking. Today, Adams shares her story. Enjoy today’s Daily Edventure with Sandi Adams! Tell me about what you see as the greatest challenges in education and how you see schools responding to these? The greatest challenge that I see in education is a lack of time and the reality of the day-to-day needs in teaching and learning. Building relationships and assessing the needs of students takes time and resources. I see teachers struggling to find a balance as they are sandwiched between administrative requests, state requirements, trainings, parent involvement and a constantly changing business plan. Schools aren’t all about curriculum and routine, they are places which can show the best we are. Could you share a short anecdote about an event that touched you? I see so many beautiful examples of how people in education serve every single day. The supplies slipped in book bags. The snacks provided. The coming in early to read, the staying late to teach multiplication. We even have schools [with] food banks that pack meals into backpacks discreetly for the weekend! Our schools are small cities filled with every type of activity, assistance and social, physical, academic and emotional service possible. It is truly awe-inspiring what is accomplished in a school. What are you reading for professional renewal at the moment and do you have any take away thoughts to share? I follow my amazing Twitter community daily, several groupme chats, as well as a set of blogs through feedly. My personal – thus, also my professional – renewal comes from the outdoors. My last two books, Becoming Odyssa by Jennifer Pharr Davis and Grandma Gatewood’s Walk by Ben Montgomery inspired me with true stories of grit and perseverance – both are traits that I appreciate more as I get older and see the need to cultivate them in our students. Why do you feel passionate about innovation and technology in the classroom? Can you share a particular instance in which technology helped transform your school and the work from the students? You can definitely say I am passionate about sharing how teachers can use technology to enhance student achievement as well as interest. In 2014, one of my schools completed 20 hours of Microsoft Innovative Educator training for the entire staff. The success of this training led to a district-wide initiative involving complete collaboration of instructional staff — over 17 schools and 1000 teachers have now completed the certification. Focusing our efforts on 21st century learning design, alongside instruction with the tools, has made the most difference. Providing technology tools and hardware without the training is ineffective. What are some steps you can share for a successful whole school transformation plan? Hands down, having leaders participate in the training and begin to use the technology has had the greatest effect. Our Assistant Superintendent of Technology Services, Bobby Blount, completed the certification alongside a group of teachers. This was followed by our Superintendent, Dr. Brian Hightower, and the entire cabinet completing the MIE training. Leadership by example is powerful. It also emphasized to them exactly how important true ICT learning is to the success of our students. Favorite childhood memory: Laying under the mimosa trees in our front yard with a book…any book. Favorite book: My Bible is my favorite book but I am a southern girl so I love Fried Green Tomatoes at the Whistle Stop Café by Fannie Flagg, Divine Secrets of the Ya-Ya Sisterhood by Rebecca Wells, and To Kill a Mockingbird by Harper Lee. What is the best advice you have ever received? My Dad had an amazing work ethic, loved people and always treated them with respect. His example was the best advice I ever had. This entry was posted in Building Teacher Capacity, Change Management and Culture of Innovation, Leadership and Strategic Innovation and tagged mieexpert, teacher training. Bookmark the permalink.